This recipe makes for a very colorful and flavorful side dish. Combine the canola oil and the pancetta in a sauté pan. Cook on low heat until the pancetta becomes crispy. Add the rest of the ingredients and turn the heat up to medium. 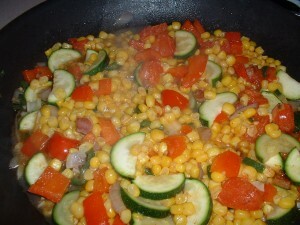 Cook while stirring frequently until the vegetables are tender and cooked through. Taste and add more sea salt and/or pepper, if desired. This squash dish captures the flavors of autumn. Mix the squash pieces with the olive oil until they are well coated. Season the squash with a teaspoon of sea salt and ¼ teaspoon of ground black pepper. Spread the squash pieces out evenly on a sheet pan. Roast in the pre-heated oven for 60 minutes until the squash is tender and browned slightly. Let the squash cool. Puree the roasted squash in a food processor. Depending on the size of the food processor that you have, you will probably need to do this in batches. Combine the pureed squash, the crushed red pepper flakes, ½ teaspoon of sea salt, ¼ teaspoon of black pepper, the butter, the yogurt, and the grated Parmesan cheese in a pot. Cook on medium low heat while stirring until the ingredients are well incorporated. Taste and add more sea salt and/or pepper, as needed. This recipe utilizes an already cooked rotisserie chicken that is available in most super markets these days along with packaged low sodium chicken stock. Of course, you can make your own chicken stock by slowly simmering a whole chicken for two hours with onion, celery, salt and black pepper in enough water to just cover the chicken. Pick all of the meat off of the cooked chicken and cut it into about inch length pieces discarding the skin and the bones. Set the chicken meat aside. In a stockpot placed on medium heat, whisk together the flour and the vegetable oil to start making a roux. Cook the flour and the oil on medium heat while always stirring with a wooden spoon until the mixture takes on a dark chocolate brown color. This should take about 20-25 minutes. Do not stop stirring or the roux will burn quickly. Add the onion. Cook while stirring for three minutes. Add the andouille sausage, the celery, the garlic, the jalapeno pepper, the bell pepper, the bay leaf, the sea salt, and the cayenne pepper. Cook while stirring for three minutes. Add the chicken stock and increase the heat to medium high. When the mixture comes to a boil, the gumbo will be at its thickest, creamiest consistency. It should easily coat the back of your wooden spoon. Turn the heat down to low. 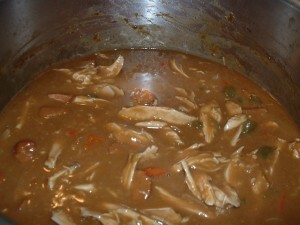 Cover the pot and simmer the gumbo stirring occasionally for 45 minutes. Taste and add more sea salt and/or red cayenne pepper, if desired. Add the cooked chicken to the pot. Cook for an additional three minutes. 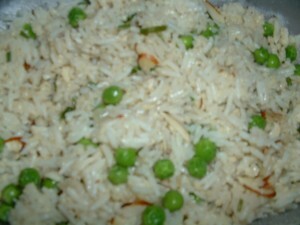 Turn off the heat and serve with white rice. Garnish with chopped parsley and chopped scallion. Combine the olive oil and the pancetta cubes in a large oven proof Dutch oven. Cook the pancetta on low heat until crispy. Remove the pancetta cubes to a plate lined with a paper towel. Leave the pan drippings in the pot. Combine the flour, a teaspoon of sea salt, and ½ teaspoon of black pepper in a large zip lock bag. Shake well. Add the chicken thighs. Shake well so that the chicken thighs get coated evenly with the flour and the seasoning. Put the pot that the pancetta was cooked in on high heat. 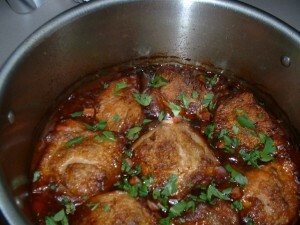 Brown the chicken thighs (four at a time) on both sides. This should take about 4-5 minutes on each side. Remove the chicken thighs to a plate. Remove the excess chicken fat in the pot but retain the brown bits that have accumulated on the bottom. Add the carrot, the celery, the onion, the garlic, a teaspoon of sea salt, and ½ teaspoon of black pepper. Cook on medium heat for four minutes stirring frequently. Add the wine. Scrape the bottom of the pot with a wooden spoon to loosen the brown bits that have accumulated. Cook for an additional four minutes. Add the mushrooms and the tomato paste. Cook while stirring frequently for three minutes. Tie the parsley stalks, the rosemary stalk, and the thyme stalks into a bundle with cooking twine. Drop the herb bundle into the pot. Add the chicken stock and stir well. Taste and add more sea salt and/or black pepper, if desired. Add the chicken back to the pot on top of the vegetables. Loosely cover the pot with aluminum foil and place the pot into the preheated oven. Cook for two hours removing the aluminum foil during the last 30 minutes of cooking time. Garnish with the chopped parsley and the crispy pancetta cubes. Serve with buttered noodles, rice, or polenta. 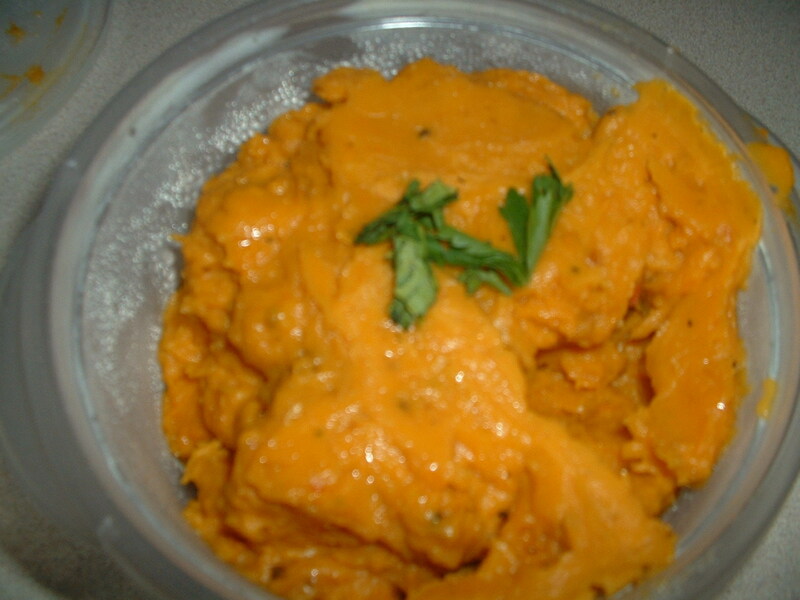 I made this dish totally with items that I had on hand in my pantry or refrigerator. Combine the onion, the garlic, the sea salt, the black pepper, and the olive oil in an ovenproof pot with a lid. Cook on medium high heat stirring frequently for 4 minutes. Add the rice and the pastina. Stir well so that all of the grains get coated with the olive oil, the onion, and the garlic. Add the chicken stock. Stir well one more time. Bring the contents to a boil. Cover the pot and place it in the preheated oven. Let the rice cook in the oven for 30-35 minutes until all of the chicken stock is absorbed and the rice is tender but still firm to the bite. Stir in the peas, the almonds, and the chives. Cover and let the rice steam for three minutes until the peas are warmed through. All of the flavors of Buffalo chicken wings are contained in this burger. Combine the olive oil, the jalapeno pepper, the shallot, the celery, the garlic and a pinch of sea salt in a sauté pan. Cook while stirring frequently on medium low heat for five minutes. Combine the cooked vegetables, the ground turkey, the hot sauce, the garlic powder, the paprika, two teaspoons of sea salt, the blue cheese, the breadcrumbs, and the beaten egg in a bowl. Mix well with your hands. Form the meat mixture into six equal patties. 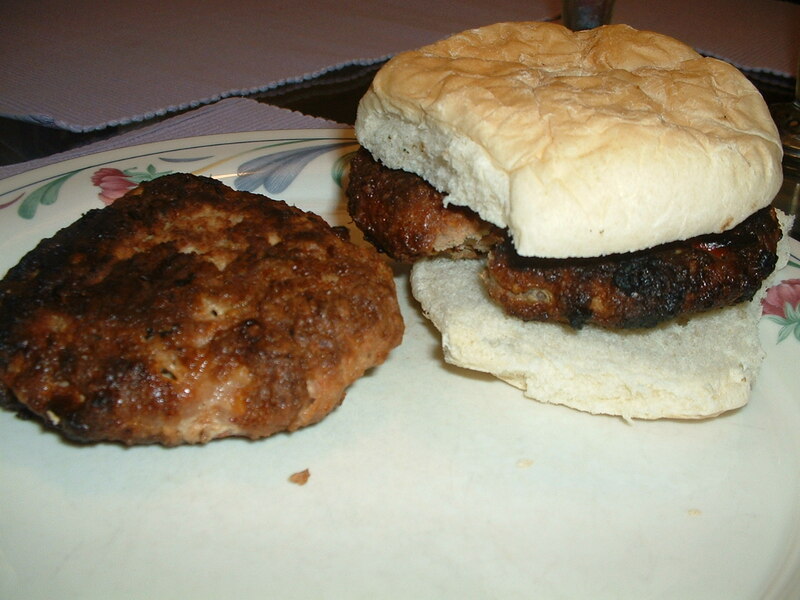 Cook the patties on a hot gas or charcoal grill for 5-7 minutes on each side turning only once until the juices run clear. Serve on Kaiser rolls with ketchup or Greek yogurt mixed with crumbled blue cheese and chives.